Revolutionize the experience of hybrid app development with Ionic app development. Design high-quality UI for native platforms from a single code. On demand dedicated resource team of Ionic developers. On-time delivery at a rocket-speed with 24×7 SUPPORT. Weekly meetings with clients via Mail or Skype. One CODE to RUN any PLATFORM. 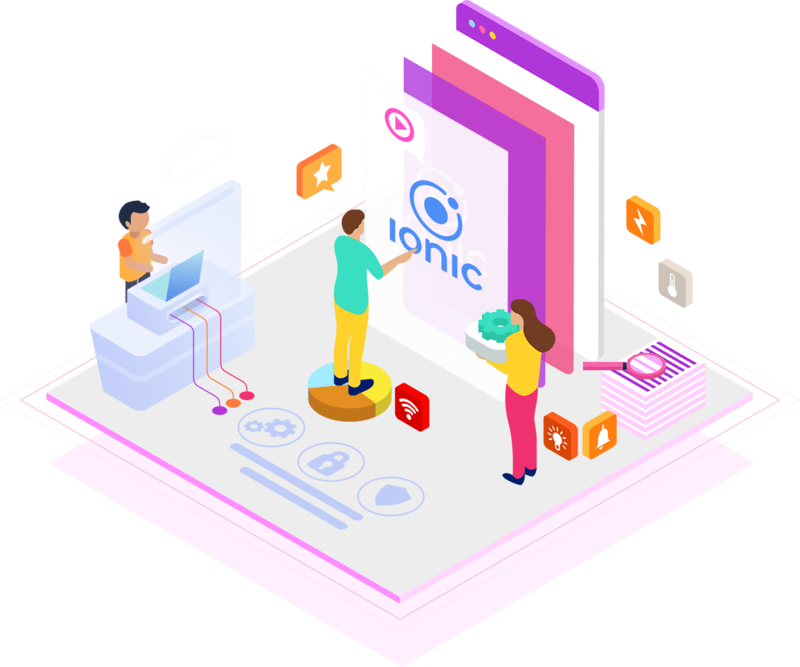 Ionic framework makes the development of hybrid application easy and smart. Our Ionic app development team brings the technology and creativity on one platform to nurture the demand of our global clients. We develop an app that can run on various platforms like iOS, Android, Windows Phone, etc. and justify your business quality. Our Ionic developers take your business to a fast lane growth providing a sales driven solution. Ionic app development creates smooth and alluring app features that enhance the user-engagement, user retention and ultimately sales of your product. Our team of Ionic developers is proficient in developing amazing UI layouts yet user-friendly. Have an idea! Hire Ionic Developer Today. Discuss your business idea with our Ionic professionals and start building your App. The apps build with Ionic leverage the substantial power and stability to web and app solutions. The base code designed by using Ionic frameworks on multiple platforms. We design responsive apps that cater to the needs of your user-base and provides 100% client-satisfaction. Our team of developers takes note of minute details that play a major role in growth hacking. The team of Ionic app development follows meticulously design strategies that brings lead conversion. We include our clients in the development process to reduce the error rate up to 95%. Yet we make sure that our post-development services always leave clients with happy faces. Enhance brand loyalty and brand awareness with cutting-edge new generation technologies. Opt for our Ionic app development services to leverage the benefits of cost-effective services. Take the leverage of working with Ionic developer at your development center at the handsome cost. We are flexible enough to work at your work station. Hire Ionic app developers in our workstation. We’ll keep the hired developers in the circuit of communication at the time of reporting. Mix and match of the onsite and offsite model, in order to achieve the desired goals. Hire Ionic developer and a team of executives who are ready to work from both the ends.